Golfer or joker? Combine both with these novelty golf balls. Choose your favorite design from Sports balls, Camouflage, Christmas or pack a punch with our Kapow balls. Jet Streamer – When hit, The Jet Streamer ejects 15 feet of streaming red ribbon. Guaranteed to shock any golfer;Phantom – Official size golf ball, with a genuine look and feel. When someonee tee’s off this ball, it implodes in to a giant wall of water;Unputtaball – When chipped or putted This gag golf ball, skips, & gyrates, but never, never goes straight. It’s hilarious & unpredictable;Exploding Golf Ball – The Exploder looks like a regular golf ball but with one very distinct difference. It blows up in a spectacular cloud of smoke-like powder! Sponge Bob Square Pants. Six Pack. 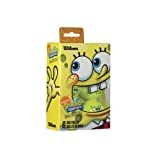 Color Is Yellow.Ideal for kids or adults with a whimsical side, each of these Wilson golf balls sports a cute SpongeBob SquarePants design that’s destined to stand out on the course. Fortunately for golfers, the balls aren’t just for kicks, however. The balls are equipped with high-powered titanium cores that produce maximum distance and optimum spin. The balls also feature a two-piece construction with cut-proof Ionomer covers, helping them hold up over time. 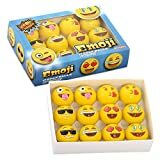 The kit comes with six SpongeBob balls. Schwetty balls are the hottest balls in golf! They’re a perfect feel in a titanium ball. Each set of Schwetty Balls comes with two golf balls that conform with U.S.G.A. and R&A Rules. These golf balls perform very well and are actually regularly used by many golfers. 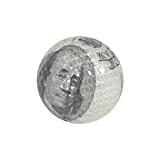 Schwetty balls are a perfect humorous gift for golfers. 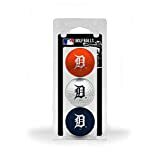 The Exploding Golf Ball Four Pack is exactly four times as funny as the regular Exploding Golf Ball, and that’s wicked funny! 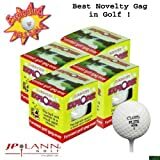 These realistic looking golf balls explode into a giant cloud of powder when hit, so the next time you want to really add a bang to your golf game bring along a four pack of these! A great golf gag and a great golf gift gift! The Exploding Golf Balls lend themselves to endless joke situations. Try it. Bet your partner that he can’t repeat that great long iron shot…drop the exploding golf ball on the fairway and stand back for the biggest laugh ever! The Balls are designed to be seen. Designed to score. The unique designed golf balls have a 75 Compression Core designed for kids, women, seniors and cool weather play. Kids tend to love the unique design — they’re easy to see and hard to lose! 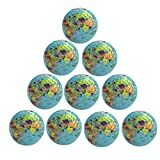 Find more Novelty Golf Balls products on Amazon!